Katherine Anne Okesson, DMA, is currently a member of the Grammy-nominated Santa Fe Pro Musica Chamber Orchestra, Performance Santa Fe, the New Mexico Performing Arts Society, the New Mexico Philharmonic, and the Santa Fe Symphony Orchestra. In addition to her current appointments, she has been a member of several other orchestras. While living in South Carolina, she performed with the Charleston Symphony, the South Carolina Philharmonic, and Symphony Orchestra Augusta. Okesson has also appeared with the San Juan Symphony, the Las Cruces Symphony, the South Dakota Symphony Orchestra, and the Rockford Symphony Orchestra. 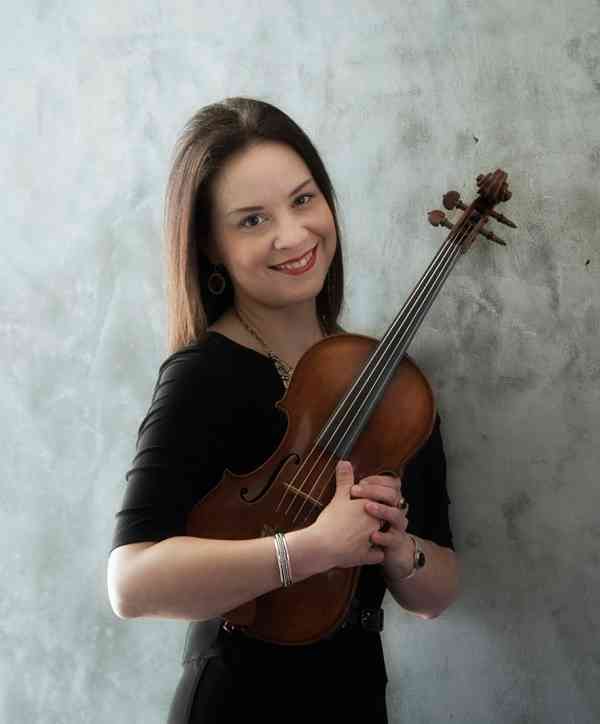 She has served as principal second and as concertmaster in a variety of ensembles. Her orchestral experience includes working under the baton of several renowned conductors, including Andrew Litton, James Levine, Eduardo Mata, and Michael Stern. The list of major soloists she has performed with is extensive. Highlights from the Classical genre include Itzhak Perlman, Joshua Bell, Yo-Yo Ma, Rachel Barton Pine, Winton Marsalis, and Midori. Performers from other genres include Jodi Benson (the voice of the Little Mermaid), Page and Plant, America, LeAnn Rimes, the Electric Light Orchestra, Peter Schickele, and the Trans-Siberian Orchestra. Katherine Okesson has participated in several PBS specials and has appeared in online orchestral documentaries. She has participated in the Piccolo Spoleto Festival, the Spoleto Festival, Eastern Music Festival, Taos Music Festival, the National Orchestral Institute, and the Hot Springs Music Festival. She will be featured as a Resident Artist at the 2018 Atlantic Music Festival. Okesson has also performed in some of the best known arts centers in the United States, including the Lensic Performing Arts Center, the Myerson Symphony Center, the Yale Gordon Symphony Center, and Alice Tully Hall (New York). As a child, she performed at the White House Christmas Party for President Bush Sr. and his family. While at the Chicago Lyric Opera House, she had the privilege of collaborating with members of the Grammy-award winning Vermeer Quartet in performances of Handel’s Messiah. In 2015, she performed at the Milan Conservatory of Music in Milan, Italy. Okesson’s available cds include premiere recordings of Libby Larsen’s Dreaming Blue and Meira Warschauer’s Jerusalem, Open Your Gates, “Open Your Gates and Receive God’s Glory.” She also played the Baroque violin on two recordings featuring the Smithsonian Chamber Players. She was featured as a soloist with the Coeur D’Alene Symphony Orchestra and the Midwest Chamber Ensemble. As a pedagogue, Dr. Okesson has taught collegiate classes in music theory, ear training, and music appreciation at Kansas State University and Northern Illinois University. From 2002-2006, she was a faculty member of Rockford College, the Rockford College Music Academy, and the Holy Names Music Center. Okesson has appeared as a guest teaching artist and violin specialist for the Heart of America Winter Suzuki Workshops and the High Plains Music Camp. She has judged solo and ensemble festivals and competitions in Washington, South Carolina, and Kansas and is presently an adjudicator for KSHSAA. Okesson is a certified teacher of the Sassmannshaus, Suzuki, and “ABC’s of String Playing” methods. She is a member of the American String Teachers Association, the American Orff-Schulwerk Association, the National Association for Music Education, the League of American Orchestras, and the Folk Alliance Music Society, along with affiliated state chapters of these organizations. In addition to her current performance schedule, she maintains a private violin and viola studio and teaches violin and chamber music at the University of Kansas. Okesson is on the editorial committee for the American String Teachers Association’s American String Teachers Journal. Okesson graduated from the Peabody Conservatory of Music with a BM in Violin Performance (studies with Violaine Melancon of the Peabody Trio, Earl Carlyss of the Julliard Quartet,and Yung-Ku Ahn, founder of the Seoul Orchestra). She received her Performer’s Certificate in Violin from Northern Illinois University (studies with Mathias Tacke and the Vermeer Quartet). Her graduate work includes a Master of Music from KSU (studies with Dr. Cora Cooper) and postgraduate studies at the University of South Carolina. She received a DMA in Violin Performance from the University of Kansas. Dr. Okesson’s dissertation, Selected Violin Works of Alan Scott ‘Vaness’ Chakmakjian Hovhaness: Two New Performance Editions with Historical Discussion, Compositional Style Overviews, and Pedagogical Considerations, is available through ProQuest. She has a number of other publications available through Amazon.com. Katherine Okesson plays on an Italian violin by Giulio Degani (Venice, 1900) and a bow by James Tubbs.